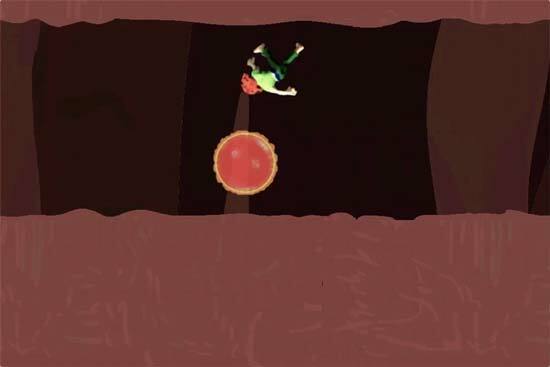 There are many ways to make levels for a platformer. In this chapter we'll discuss how to create levels using tilemaps, then use Box2D to bring them to life. 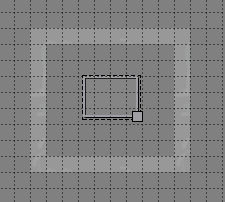 A tilemap level uses an image file subdivided into a grid of tiles. 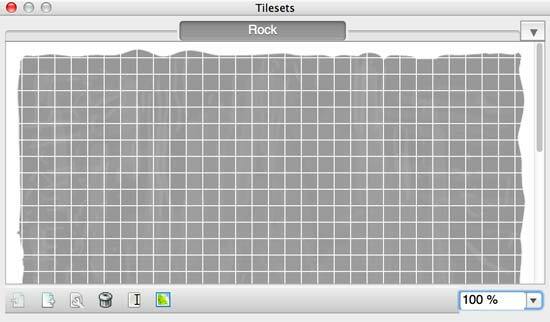 The below screenshot shows a tileset named "Rock" with 16 x 16 pixel tiles. The tiles can be selected from the tileset and drawn to create a tilemap level. 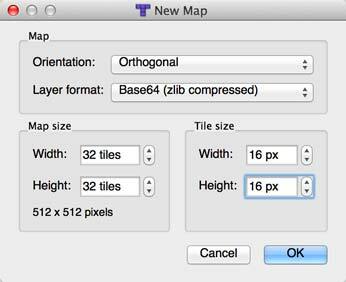 The Tiled map editor is a free, open-source application you can use to draw tilemaps. It uses the .TMX file format, which Cocos2d-X can parse and import into your game. Download the Tiled editor. It's recommended to grab the latest version available for your system. Also download the tilemap image file Rock.png. Open the Tiled application and choose New from the File menu. Choose Orthogonal from the Orientation dropdown and "Base64 (zlib compressed)" from the Layer format dropdown. Set the Map size to 32 x 32 and the Tile size to 16 x 16, then click OK.
Now let's give it the rock tileset so we have something to draw with. 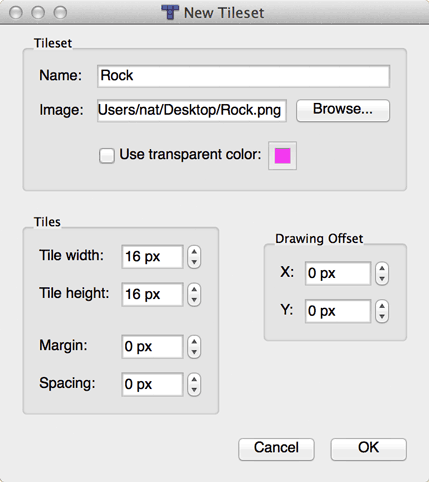 Choose New Tileset from the Map menu, then click Browse button next to Image and choose your copy of Rock.png. It will automatically fill in the name "Rock" for the tileset. Make sure the Tile width and height are 16px and the margin, spacing and offset are 0. Keep in mind that you can have multiple tilesets per tilemap. However, you have to be careful to draw using a single tileset per layer. If you accidentally mix tiles from different tilesets in one layer, you will likely cause a crash when you run your game. When you're finished drawing the level, it's time to add some objects. Objects can be things like the player, enemies, items and other physical things. 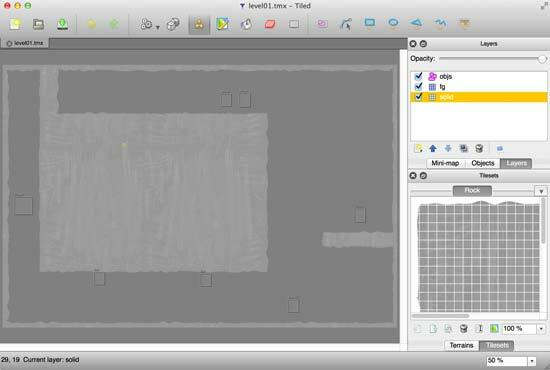 Choose Add Object Layer from the Layers menu, then choose the Insert Rectangle tool. Now save your level file and add it to your game's project. That will create the map. Behind the scenes, Cocos2d-X loads the TMX file, parses all the tiles, loads the tileset images and parses the object groups. You can then create a Box2D fixture for each of the tiles to form a physical world that your player can interact with. Note that we will discuss Box2D in further detail in a later chapter of this book. That will create a 16x16 static Box2D fixture with a little bit of friction at each position where you drew a tile. 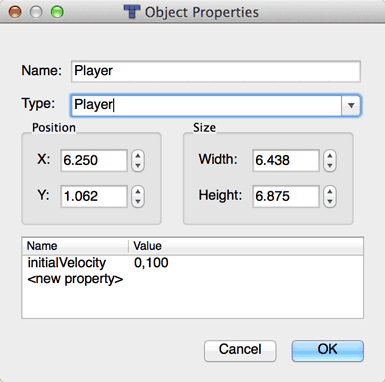 Next it's time to create your game's objects from the object data in the tilemap level. Now that we are in the day and age of having to create multiple tiers of art assets for multiple devices, we need a way to turn our SD TMX level file into HD and HDR (HD Retina). Luckily, there's a tool created by WasabiBit called WBTMXTool which can scale TMX files. You design your level in SD, then convert up to HD and HDR using the tool. Done. It’s just been replaced with a const float for now. In the Paralaxer project, getPixelsPerMeter() returns 32 in SD and 64 in HD. Actually, it should be more accurately named “pointsPerMeter”. As for WBTMXTool, does it scale both the values in the TMX file and the PNG associated with it? Good question. The answer is that it only scales the values (like positions and sizes) in the TMX. You need to manually create smaller or larger PNGs, or use TexturePacker to automatically export them. It’s great to see WBTMXTool I created before. My domain name got changed to wasabibit.org. Hope everyone finds it useful! Nice tutorial. I have one question in my mind that if i want to support all the android devices that i have to include all the tiled map created by WBTMXTool? Is there any other way to use only one map for all the devices? Sure. You can use just one tiled map. Just set up your design resolution the way you want and stretch the screen as you see fit. ‘width’ and ‘height’ allow you to change the dimensions of the fixture. Great article and thanks to you that I found this great tool: “WBTMXTool”. Works perfectly for iOS devices. Now that I am porting to Android devices I have realized that simply scaling by factor 2.0 for SD and HD version will not work. Will this tool work for different scaling factor as well? For example, google says that from mdpi to hdpi, the scale factor is 1.5X. If I change the scale factor in the tool to 1.5x, will it work? I think so. If not, you can edit the tool’s code.